Team Diva Headwraps - headwraps and tees from our earlier collections. Visit us on SUNDAY 2 SEPTEMBER at the Young Designers Market, Little Stanley Street, South Brisbane. Headwrap demonstrations and styling on offer throughout the day as well as personalised styling for all customers. We're excited to be launching our latest collection of colourful ANKARA and block colour CREPE designs - purchase separately or as a combo! There'll be plenty to choose from ... our VELVET range will be up for grabs including our new batik MINI HEADWRAPS, ankara BEANIES and kente BANDANAS. Grab a coffee, lunch, or a snack from the many sidewalk cafes. Enjoy a stroll down Little Stanley Street as you browse the many unique stalls on display. Our display at one of our recent market appearances with the Young Designers Markets. Would you like to know how to style one? 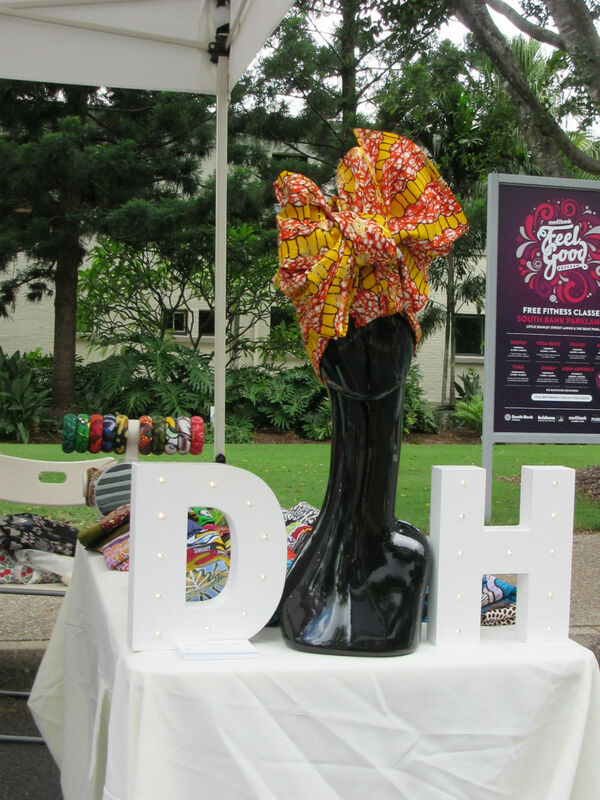 Join us at the Moorooka Saturday Markets where we'll have our unique collection of ankara headwraps, bandanas, bangles, beanies and accessories up for grabs. Visit our stall to experience first-hand our popular headwrap demonstrations - these will be conducted throughout the morning. Embracing the rich cultural diversity present within our community, the market aims to provide an exciting platform to bring together authentic new emerging community groups as well as existing community groups and businesses. Held within the serene surroundings of the Manmeet Memorial Park this second of four markets is proudly supported by the Moorooka Ward and Councilor Steve Griffiths. It's a FREE family-friendly fun event with kids activities, arts and crafts stalls, live music including a sausage sizzle. Visitors are welcome to try out the existing restaurants and cafes nearby!